Willem kopieëren en dan opsturen naar foto op linnen krijg je geen spijt van! wacht ff, ik moet nog ff de piepers onderwater zetten. I would like to thank David Slinger for sharing his research on this vessel. 1965: To Fleetwood as a new vessel. February 1968: Carried out experiments by the Palmer Aero Products company using de-icing equipment, that reduced the likelihood of capsizing. Despite its modest cost of £2,000, Palmers recieved no orders. December 1972: Transferred to Grimsby. October 1973: Set a new port record for a 140 feet vessel. Landed 2,258 kits. Grossed £34,339 Skipper Derek Browm. 22 Days Iceland. 7th December 1978: Arrived at Lowestoft to be converted to an Oli Rig Stand by Safety Vessel. April 1985: Renamed Colne Phantom. 1987: Registration transferred to Claridge Trawlers Ltd, a subsidiary ofColne’s. January 1992: Sold for scrapping to Carvel Marine, Rainham, Kent. 6th January 1992: Sailed from Lowestoft bound for Rainham, kent on the River Thames for scrapping at Bloors Wharf. 1992: Sold to Caroline Paternity Limited, South Africa. 4th April 1992: Arrived at Lowestoft in tow of Anglian Warrior and subsequently slipped for repairs and a survey. 2nd May 1992: Sailed from Lowestoft as Colne Phantom. Registered at Kingstown bound for South Africa. 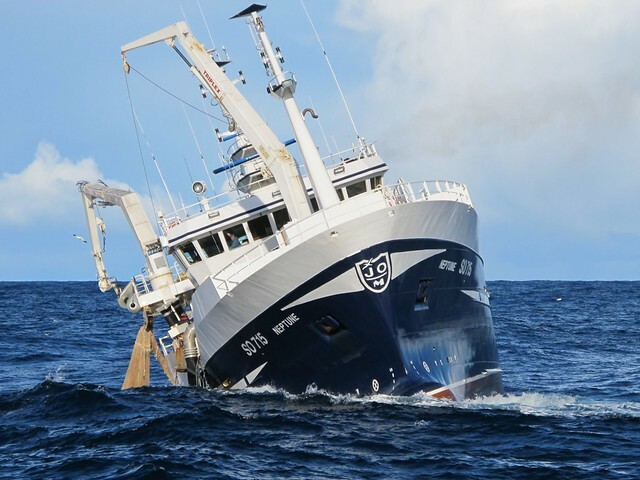 In 1992 she was converted to a stern trawler and returned to fishing. September 14 2000: Vessel has been refitted at the cost of 1,000,000 Rand. October 2007: Reported sold undisclosed interests. 26th March 2009: The Boston Phantom now “Colne Phantom” was last seen in Cape Town fish dock 26th March 2009. Believed to be laid up. Foto's van de visserij... Kijk op www.schollekop.nl !